When you are looking for some help with your landscape in Midland, TX, count on the landscape design contractor team at Grass Hopper Enterprises Inc. From patio design to pergolas design and more, we can help you transform your outdoor living area into a complete oasis. Grass Hopper Enterprises is locally owned and operated right here in Midland, TX and has been in business since 1983, owned by Earl Keller (LI7230) and his family. We provide the best service at competitive and affordable rates. Choosing a reliable and experienced landscaping company can be daunting. You never know who you will be dealing with when you hire a company for your job. That’s why Grass Hopper Enterprises is your choice in Midland, TX and Odessa, TX. We built our reputation on our commitment to providing quality service, which has earned us many valued customers. Each one of our team members is a landscape and hardscaping design contractor, capable of serving the homes and businesses of Midland, TX by designing a wide range of landscapes and other outdoor living areas. Like any good landscape design contractor, we work to make sure your landscaping design is not only suitable, but one that will thrive in our varying climate. The care and love put into all of our landscaping jobs can only come from a family that truly loves their community. With over a quarter-century of experience, we have the knowledge and skill to handle any project and to make your dream a reality. We are one of the top xeriscaping design contractors in the area! As xeriscaping design contractors, we are well-equipped to ensure that your landscaping and garden are built to conserve water. Xeriscaping design contractors work to protect the environment and improve the soil on your property. Call us today at 432-652-6462 to learn more. When it comes to your landscaping needs, we work every job from start to finish. We can help you choose the patio design that would work best for your back yard. We start from the patio design to the installation right down to the smallest finishing details to make your back yard the best in the neighborhood. From helping you choose attractive paver stones to planting the final flowers, we handle it all. When it comes to our landscaping jobs, we want things done right the first time. That’s why Grass Hopper Enterprises provides all of our services without the use of subcontracting. You get a great final result without the hassle of dealing with many contractors. We are a small company with a focus on our customers. When you contact Grass Hopper Enterprises, you will deal directly with our landscape design contractors every time, no exceptions. As a hardscaping design contractor, we offer a variety of services to help you improve your yard, including landscape design, pergolas design, hardscaping, paving, flagstone and paver stones, waterfall design, patio design, pergola design, and pergola installation. A pergola is used to make the outdoors more inviting, to extend livable space, to create a shady retreat, and serve as a major landscaping element. Any pergola built by us will add grace, style, comfort, and architectural character to your home. We help you create an environment that reflects your own personality and style. Beautiful and functional outdoor spaces renew your energy and focus while creating usable space for outdoor entertaining and even exercise for you. Landscaping is an investment in your property and more importantly, your well-being. A well-thought out landscape in Midland, TX can often be used year round, so go ahead and call us. You really don't need an excuse, just a passion for a beautiful Texas landscape. 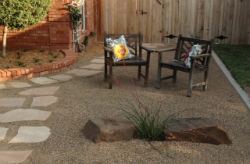 Our passion is to offer you the best landscaping service in West Texas. So pick up the phone and give our landscape design contractors a call; you’ll be glad you did, and your yard will love you for it. Also, feel free to check us out on Facebook for some of our landscaping pictures!